Monday morning: I played hooky from work with car and airplane maintenance scheduled. Remarkably, both appointments were complete by noon. I stood on the ramp at Genesee County Airport with a warm sun shining down from a perfect blue sky and I was inspired. To consume the remainder of my vacation day, I planned a short cross country flight to Beaver Falls, PA. Beaver County Airport (BVI) has been on my list for some time for two reasons: the rumored greatness of calzones from Sal's Ristorante and the humble Air Heritage museum located on the field. The combined promise of good food, a new museum to explore, an out of the area flight on a nice winter day, and a new destination was more than I could resist. From 6500' en route, the east end of Lake Erie near Buffalo was visibly frozen over completely. I passed into shadow for a few minutes. Oil City, PA is laid out in a radial fashion, influenced by this oxbow of the Allegheny River. I was impressed with Beaver County Airport. The towered field has a single east-west runway, a plethora of hangars, and boasted a fair amount of traffic at the time I arrived (there were four airplanes behind me in the pattern at the time I touched down with one other holding short for departure). It had the feel of a very healthy GA airport. I landed in a near direct crosswind of 10 knots gusting to 14. After parking on the main ramp, I walked to Sal's. I am very pleased to report that my calzone ("The Boss" - ham, pepperoni, salami, sausage, and banana peppers) was the best I've had since my last visit to Erbelli's in Portage, MI. As an added bonus to visiting pilots, Sal's had free WiFi available, allowing me to plan the flight home on my iPad. After a very satisfying meal, I returned to the airport and the Air Heritage Museum. Admission is free, though donations are appreciated. I slipped a few bucks into the collection jar and spent the next hour with Greg, one of the volunteers. The Air Heritage Museum is very much a work in progress, but I always enjoy seeing such things. When I first spotted this, I wondered if it was someone's attempt at being cute. But, no. The tail is actually attached to the aptly named "Thunder Pig", a Fairchild C-123 Provider cargo aircraft. What I initially mistook for novelty was the museum's way of managing an airplane too large to fit in the hangar. In the summer months, this airworthy cargo ship flies to airshows in the northeast. Somewhat shockingly, the C-123 design began life as a glider. It is powered by two Pratt & Whitney R-2800 radial engines with a cowling design that opens like a flower to provide access to the engine. The aircraft also featured jet engines for take-off assistance on short strips or when heavily loaded. However, the turbines had been removed, leaving behind empty pods hanging below the wing outboard from each radial. Because the R-2800 is such an amazing machine, here's a picture of the other one in better lighting. Greg escorted me inside and I got to check out the front office. I think every instrument in the cockpit must have been original; no modern radios or GPS boxes could be seen. The navigator's station, docked to the rear wall of the cockpit and suspended over the cavernous cargo area featured an old tech LORAN unit about the size of a tacklebox. Static lines for paratroopers were still strung near the ceiling of the fuselage. F-15s are not terribly common in museums, but Air Heritage has one. An airworthy C-47! This C-47 was most recently used as a spray plane. Greg explained that it was going to be a big project to rip out all the remaining plumbing. I asked if the previous owners decontaminated the plumbing before selling the airplane. Even though I was playing hooky from work, chemists will be chemists. Greg's response suggested that this notion had not previously occurred to him. After seeing this photo, my father-in-law in Fort Myers, Florida recognized it as a former member of the Lee County Mosquito Control fleet from Buckingham Airfield (FL59, Fort Myers, FL). With some judicious research, he located a FlightAware track of the airplane being flown to Beaver County dating to when ownership transferred from Lee County to the museum. This museum-piece in Pennsylvania used to spray for mosquitoes over my in-laws' house in Florida! After 45 minutes at the museum, I took my leave and returned to my waiting airplane. My original plan was to purchase fuel from Moore Aviation before departure, but there were already four aircraft parked around the fuel pump with no one in sight managing them. I decided to depart for Clarion County for fuel instead, another new airport for me (#142). Off Beaver County and level at 5500', I was turning on course to Clarion County (AXQ) when the ground speed display caught my eye. I think 169 knots (194 mph) may be the highest ground speed I have ever experienced in level flight in my airplane. I resisted the urge to push the nose down and bump the ground speed into the 170s and simply captured the moment as it happened. The return home was rather expeditious. The Allegheny Reservoir on the New York - Pennsylvania border appeared to be filled with milk instead of water. Nearly back to Le Roy, I was struck by the textures outside my window. As shown by the green leg of the above GPS track, I came to appreciate how much more precisely the airplane must be flown with ground speeds north of 160. At those speeds, even a 1° course deviation quickly registered as an excursion on the CDI; I must have S-turned all the way from Beaver Falls to Clarion County. Overall, I had a nice afternoon jaunt. I stretched my wings, explored two new airports, flew really fast, had a great $100 calzone (the best $100 hamburgers are rarely hamburgers at all), saw some interesting sights, and learned a bit about some new (to me) airplanes. Having been born in the fast-paced information age that is the 21st century, my daughter has "maintained" her own blog since infancy. The following trip report is cross-posted from her blog, an account of a $100 hamburger run told from her point of view. On this flight, she logged her 197th flight hour. Another typical Daddy-Daughter kind of day where we went for a "$100 hamburger". This is a foreign concept to some, so I thought I would spend some time explaining it. Pilots like to fly, right? And pilots like to eat, right? So...there you have it...the $100 hamburger. That's right, it's always best to have a bite to eat right before flying for food; sort of a "pre-meal". Channel locks are optional. When it's 10°F at the airport, it's best to sit inside the pre-heated airplane while your pilot does whatever it is he has to do out in the freaking cold. Silly, silly pilot. Ear protection is both healthy AND provides a means for you to hear your Nintendo DS. Or air traffic control...whichever floats your boat...er...lifts your airfoil. Frosting is not just for cakes. Flying can open up excuses to discuss ecology and the environment. Watch out for seagulls! 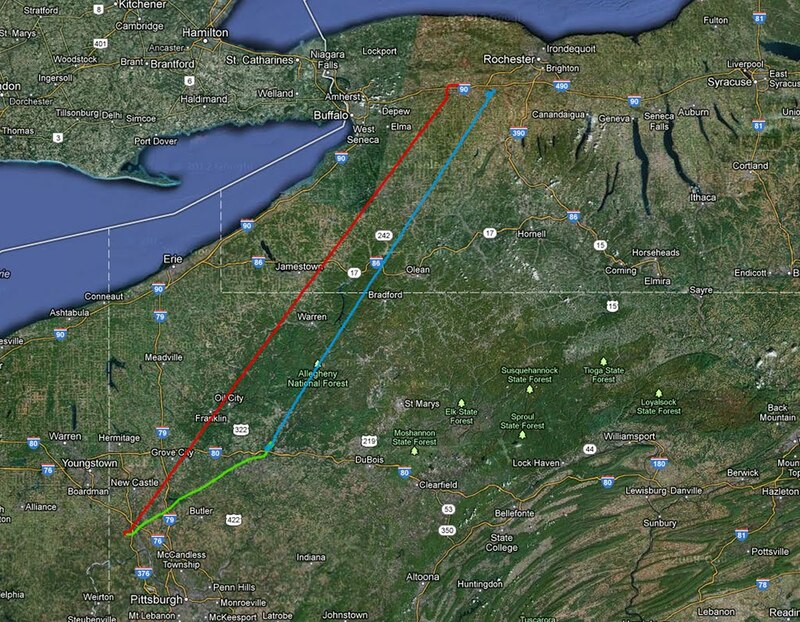 This is our destination, Dubois Regional Airport in Pennsylvania. Evidently, Pennsylvanians are not so much into French pronunciation. Tic-tac-toe will only work for so long as a means to pass the time. Just call me Joshua. ...yummy, yummy, pancakes. Excuse me whilst I dive-in. I can't believe I ate that much! I told Daddy that I felt like I had a big ball of something in my stomach. Daddy hypothesized that the ball may have been made of pancakes. Therein lay another lesson for the morning. Fixed Base Operations are great places for spontaneous dance. Ah, I get it now! Roads go around the big hills. One of life's simple pleasures is sitting in an airplane while your Daddy grunts and groans and slides around on the ice trying to push it back into the hangar. The lesson in this: it's good to have friends. Fortunately, one of Daddy's stopped by to help. The final lesson of the day: airports are great places for driving lessons. Mine are coming along wonderfully. And with that, we drove off into the sunset (ok, it was the middle of the afternoon), another $100 hamburger mission in the can. And, would you believe it, I was hungry again before we ever got home. I recently started transcribing my logbook into an electronic format after a computer crash last year wiped out my previous electronic version. While this activity was the very essence of tedium, it was also enlightening. I realized that I used to spend a lot of time drilling on the basics: airwork, performance take-offs, simulated engine failures, etc. Although I still drill on the basics, I do so less frequently than I used to. So today, I made time to fly and the weather (for once) was cooperative. I ran through much of the private pilot repertoire, starting with the pattern. I made eight trips around the pattern, performing a mixture of take-offs and landings that included: normal, short field, and soft field. Some of the landings were done with full forward slips, with simulated engine failures, or without flaps. I have not performed a no-flap landing in some time, but was pleased with tonight's result. Thus warmed up, I departed the pattern (yes, I realize that the pattern exit is non-standard, but it kept me from busting Rochester's airspace). 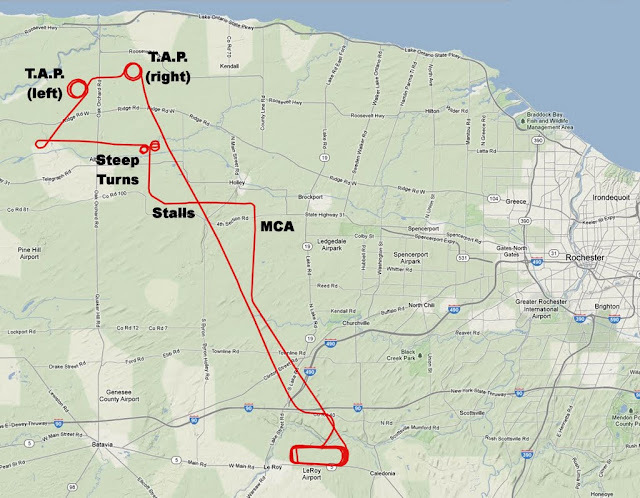 I flew north at minimum controllable airspeed (MCA), turned west and did a set of power-on and power-off stalls, ending with a power-off stall in a right turn. After recovery, I executed a set of steep turns (two complete 360° turns in each direction), then descended for turns-around-a-point. I made three turns around my ground reference point to the left and two to the right. I cannot even remember the last time I did a turn-around-a-point to the right, but I am reasonably certain that it was in a Cessna 150 about ten years ago (I know, shame on me). Regardless, both look reasonably round to me in the GPS ground track above. As an added bonus, I got to see some blue sky for a change. Though I was a bit rusty at times, every maneuver was within tolerance. At the end of it all, I shut down the airplane with a sense that I had given myself a good workout. I suspect that most pilots have a maneuver or two in their repertoire that they do not practice often.